Stat Model Predicts Flat Temperatures Through 2050 | Watts Up With That? While climate skeptics have gleefully pointed to the past decade’s lack of temperature rise as proof that global warming is not happening as predicted, climate change activists have claimed that this is just “cherry picking” the data. They point to their complex and error prone general circulation models that, after significant re-factoring, are now predicting a stretch of stable temperatures followed by a resurgent global warming onslaught. In a recent paper, a new type of model, based on a test for structural breaks in surface temperature time series, is used to investigate two common claims about global warming. This statistical model predicts no temperature rise until 2050 but the more interesting prediction is what happens between 2050 and 2100. David R.B. Stockwell and Anthony Cox, in a paper submitted to the International Journal of Forecasting entitled “Structural break models of climatic regime-shifts: claims and forecasts,” have applied advanced statistical analysis to both Australian temperature and rainfall trends and global temperature records from the Hadley Center’s HadCRU3GL dataset. The technique they used is called the Chow test, invented by economist Gregory Chow in 1963. The Chow test is a statistical test of whether the coefficients in two linear regressions on different data sets are equal. 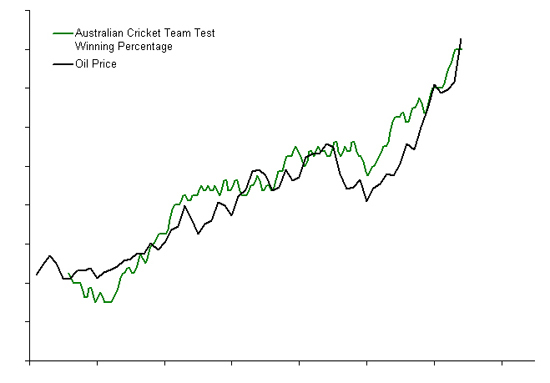 In econometrics, the Chow test is commonly used in time series analysis to test for the presence of a structural break. A Chow test for structural breaks in the surface temperature series is used to investigate two common claims about global warming. Quirk (2009) proposed that the increase in Australian temperature from 1910 to the present was largely confined to a regime-shift in the Pacific Decadal Oscillation (PDO) between 1976 and 1979. The test finds a step change in both Australian and global temperature trends in 1978 (HadCRU3GL), and in Australian rainfall in 1982 with flat temperatures before and after. Easterling & Wehner (2009) claimed that singling out the apparent flatness in global temperature since 1997 is ’cherry picking’ to reinforce an arbitrary point of view. On the contrary, we find evidence for a significant change in the temperature series around 1997, corroborated with evidence of a coincident oceanographic regime-shift. We use the trends between these significant change points to generate a forecast of future global temperature under specific assumptions. January 6, 2010 in Climate_change, Forecasting. This reminds me of Asterix and the Soothsayer – the bogus soothsayer’s favourite quote was “this I had forseen” after everything that happened. The peasant villagers were in awe of him! The only reason the exaggerating warm mongers predict so far out is because no one has evidence to post against their claims. Today. Who predicted this northern hemisphere frigid events last summer? If they didn’t they need to be ignored for having defective models. declare Real Climate a Best Religious Blog Weblog Award Finalist for 2009. It makes sense they predict warming by reason of faith. What sense has to base anything on HadCRUT? It is like genetic researcher basing its study on Lysenko pseudoscience. There’s a lot crystal-balling behind all this. +/- 1 degree C either way over 100 years wouldn’t be noticeable if no one talked about it. Aaah quick ship a copy off to the Australian government – they keep thinking the earth has a terrible fever and they must tax us all to death to stop it! All these climate predictions / forecasts are utter crap. What matters is what will happen to the climate in the next 100 years and nobody knows. The Met Office (if honest) can tell you how useless their computer forecasts are for the next 12 months. I will remain a sceptic until they have proof of AGW and not warm weather events, otherwise I will cite the freezing weather in the USA, Europe, China etc., as a sign of the arrival of a Little Ice Age. I read this a few weeks back. While it seems to have a good outlook, something that bothers me is the durations of future flat/cooling and warming trends. If you look over the past few trends, they had durations of around 30 years, and these guys are looking at 40 and 50+ year trends. Juraj….i was thinking the same thing. Shouldn’t HadCRUT be tossed out by now in experiments used to predict anything? predictions that might ultimately falsify AGW. I believe Obama’s Science Czar did… back in 1971. He sure knows how to pick ’em! If i understand this correctly they use a technique usually used in technical analysis of stock charts. I won’t say they’re prediction is better or worse than the ones you would get with an unbiased GCM but it’s a fresh start. Gotta look into that Chow test. But… but… but… I thought the science was settled! Now I’m confused. Did everyone else sleep through the past 18 months and miss the great recession? To paraphrase Gene Siskel, this isn’t scraping the bottom of the barrel, this is digging up the ground underneath the barrel. So, I could use a random number generator and produce a prediction that is better than the “re-factored” GCM. Actually, I thinks Patrick Michaels showed that this was the case before the re-factoring. As a note, software developers usually don’t consider it “re-factoring” if the output of code changes. Refactoring generally refers to making code more portable and maintainable. Slightly OT, but have we reached a tipping point for temp decline acceleration with the increased snow cover? Seems apparent to this untrained eye on Cryosphere that there has been a huge increase in N Hemis. snow cover, including about 1/2 of the British Isles. Any models have temp predictions that take this into account? Also, we’re hearing almost nothing current about the arctic ice pack. Isn’t this awfully similar to technical analysis in financial trading: statistical models that test well against the past but with uncertain predictive power? As far as I can tell, there is no real hard science (“laws of climate”) within the climate models. In financial trading, when money managers use the wrong models to deliver suboptimal results, they get fired. Too bad there is no such feedback mechanism for the bad climate models. Isn’t the stepwise function probably due to poor data? Anthony, is it at all possible to make some type of chart that shows where all the data comes from, which goes into which data sets, and all of that? And just how good were those econometric models at predicting our present economic melt down? Look, I am an economist. And there is much about the field that is valid and that I enjoy. But: I make a living from doing what economic theory says it is not possible to do. I “beat the market”. So do a large number of other traders. If computer models of chaotic systems could predict with any skill, you would see a whole bunch of rich economists. Instead what you see is a whole bunch of rich traders (who’s skills are more closely tied to those of gamblers than economists) and a bunch of very poor economists. Trading is a very different skill set. It is all about following the trend when you have it AND doing very early very fast “inflection detection” when it changes. And chaotic systems DO change, and fast. IMHO, as a person who trades for a living, 1998 was a “blow off top” in temperatures exactly was we see in stock charts. Now I can’t at all tell you why they both act the same, but I can tell you that I see the same patterns in them. At many tops, you get an unsustainable spike up, then a plummet. As a trader, catching those inflection points is everything, and that is why 90+% of folks who trade, lose. They win for a while, then miss an inflection, and are wiped out. That is what I see happening now in the AGW crowd. The inflection happened (IMHO on a 60 year PDO, the 30 year 1/2 cycle has swapped) and they are finding ever more desperate ways to show that their trend following model will start working again Real Soon Now. If they are like most folks, they will continue this behaviour right into the next little ice age. That they chose to use econometric tools to do this is, to me, confirmation of their error. If you want to be right, use trader tools… I’d use a MACD – moving average convergence divergence. We have about 200 years of decent data, so I’d use a 25 / 12 / 6 years set of simple moving averages for my moving average stack and the usual MACD formula uses a 9 period exponential moving average as the signal line against a 12/26 baseline. Visualizing that (I’ve stared at a million of these, so I can visualize it now even though it will be encrypted Greek to most folks) shows a top inflection. MACD will be screaming down (EMA of 9 years since 2000? Yea, down. While 12/26 period ought to be up tilted rolling into flat). A 25 year SMA will be on top flattening, while a 12 year will be flat and a 6 year will be under it. “SMA stack rolled over”. And that would be a screaming SELL!! top inflection no doubt about it. I’m “due” to make an updated posting of it, but the charts are live charts and you will see what the market looks like today. Down toward the bottom is a link to a description / explanation of the “indicators” that will do a better job than I’ve done in this comment. Nice model, did they use a ruler and pencil for that graph? By the way, the Earth will continue to warm after 1000 years pause. There is no way to verify this, but it is what our reliable model(s) predicts. Global Warming is still ON! Proves crap GCMs can predict any crap they are programmed to predict — Known as GIGO. Let’s test these crap GCMs, set the initial date at AD 1 and predict the next two millenium. Publish your results … in a language even a polar brown bear can decipher. What is the excuse, it’s almost cost free, it’s just computer time. Engineers call this model verification. Reply: I dunno, Henry…you have to remember that “weather” isn’t climate until it’s aged at least 100 years, then it suddenly becomes “climate”. This lets all of ’em off the hook, obviously, and puts them in the driver’s seat when it comes to imposing policy, collecting taxes, fudging data, etc. I mean really, who in their right mind could argue with them that far out? It will be our fourth or fifth generation of grandkids that will have to watch this fairy tale work out and by then nobody will remember what the predictions were. But it won’t matter–they’ll be too busy scratching out a living to care. I’ve just completed a series of wavelet analyses that reinforce earlier analyses I’ve done that support Barkin’s suggestion that the Earth “galloped” in ~1998. Statistical inference is a HOPELESS way to approach the problem (at this stage), since we don’t yet have the conditioning worked out. More effort needs to be invested in identifying the combinations of factors that lead to regime shifts. Mainstream assumptions of randomness will continue to mislead in the meantime. I suggest that people study the EOP (Earth orientation parameter) records very carefully as they are full of clues about terrestrial regime shifts. Because of the polar motion record, for example, I’ve now isolated time-normalized wavelet-power curves for aa index, QBO (quasi-biennial oscillation), & AO (arctic oscillation) that appear nonrandomly related (more detail another day – suffice it for now to say these are NOT “simple linear correlations”). this is just more proof that you can make a model do what ever you want it to do. the in thing now is to hav some stable time then global warming will take over again in some arbitrary span of time. watch out every new model will have this as its new feature. Why don’t they just tell us who will win the 2050 Super Bowl? Their computer-modeled sports prediction will have just about as much value as their weather forecast. A copy of the paper is available here http://arxiv.org/abs/0907.1650. E.M. Smith: Incredibly well put. These future climate predictions are absolute rubbish. We all know that, I just had to get t off my chest. No one knows. Quoting E.M.Smith, If computer models of chaotic systems could predict with any skill, you would see a whole bunch of rich economists. Instead what you see is a whole bunch of rich traders … and a bunch of very poor economists. This is both amusing (sorry) and enlightening. Exactly. Thanks. I take the view making predictions on climate is a total wast of time. Just wait and we’ll know soon enough over the next few years whether the IPCC models have any supporter. Clearly if the IPCC predictions are correct then global mean temperatures must rise dramatically over that period. If they don’t then the models are definitely wrong and will be dumped even by the IPCC if they are to avoid being recognized by everyone as a complete joke. What, no “return with a vengeance” after 2050? In my eyes, one of the more serious problems with AGW model programmers is that it seems they just can’t believe there won’t be a “monontanous” increase over significant periods. . . so in their eyes, any intermediate cooling *must* be followed by a period of “catch-up” increased warming to return to their model trend lines. It would be interesting to know what they would show if they had the courage to believe that there would be natural variation intermediate breaks that would be followed by the previous trend of warming rather than a “catch-up” over-trend warming to get back to their overall trend. But then they might have to give up scare-mongering about imminent “tipping-points”, and they certainly don’t seem willing to do that. Climate has been known to impact economic mood. Sometimes it ominously preceeds it, but only in hindsight. The Great Depression had it’s Dust Bowl. The Great Recession has it’s Deep Solar-Polar Bowl. Well I almost believe the GCMs; well almost right up to the very last real data point (if any) that was entered into the simulation run. But go one nanosecond beyond that last datum entry, and you are off in the wild blue yonder as far as I am concerned. I’d rather have you predict in what compass direction (0-360 degrees) the center of mass of the world’s termite population is going to move, as a result of the coming anthropogencimanmade climate change; that is supposed to cause everything to move a quarter of a mile each year. Get back to us when you have that worked out. They need to apply Black-Scholes to the data to find out what their climate derivatives are really worth. And yes. That is sarcasm. I’m looking at that wide swath of future dotted lines, and I’m trying to picture which of them proves the logarithmicity of the temperature anomaly/CO2 abundance; that the climate has faithfully follwed in the 600 million odd years since the Cambrian era. And one of these days I’ll crack those html tags ! Mandelbrot wrote a book in 2005 about the Misbehavior of Markets, he warned that fluctuations weren’t Gaussian, they were L-stable, fractal distributions with long tails, the long tails are where E.M.Smith is making his money. Analogously, the Climate fluctuations are L-stable as well, but none of the folks who are “trend followers” are going to make any money at all – bring on the Bears (Polar Brown Bears)! I keep forgetting to post this, so here. Now there is the data both CO2 and temperature; Lord Monckton has himself cited this data. So I don’;t know where the raw numbers are stored, but some of you younger folks with much better eye sight than I have might try extracting some point by point simultaneous values for global temperature, and atmospheric CO2, and then plot us a graph of (T) versus Log(CO2). I’m sure just about any log base will do just fine; but if you are clever and use base (2) , then you will automatically come up with the correct value for Steven Schneider’s “Climate Sensitivity” fundamental physical constant. Well sorry I don’t have any grant money to support that research; but when Obama finds out about your Herculean efforts, I am sure he will make you the “climate sensitivity” Czar, or Tsar, as you wish. Three cheers! IOW, to quote a trader’s maxim, “The trend is your friend until the bend in the end.” These warmists can’t conceive of a “bend” beyond the scope of their projections, they have no feel for the dipsy-doodle Nature Of Things, they’ve got no swing — i.e., they forbid nature to have any significant “variations” of its own. They are “straights” or “squares” in the bad sense of the words. They arrogantly impose their logical bean-counting structures (“forcings,” “heat budget”) on reality and think they have all its factors accounted for — and thus they qualify as natural-born losers, like stock-trading, formula-fooled economists. You can just bet that the Pranksters on Olympus have seen these flatulent flat-landers as ripe for a comeuppance, and have been egging them on into ever-greater hubris, in order to make their nemesis (begun this fall) more fulfilling. “It’s cosmic!” as we used to say, back in the day — i.e., it’s a cosmic joke. Such a pie-in-the-face is what the fates are poised to deliver to every profession and institution in a top-lofty position: tempt it to go overboard with its fancied omnipotence and/or omniscience, to its ruination (or at least to its spectacular embarrassment). It’s been science’s turn to make a gigantic jackass of itself for quite a while, and the fates have laid out a tempting trap (“save the world and be lauded as saviors thanks to the skills and character possessed by members of your guild”). A trap into which science’s Leading Lights (its gatekeepers and societies and publications and popular popularizers) have boldly put their collective foot. Envoi: Currently colleges (in effect) teach that “(those) men were fools,” which implicitly suggests, “but not us,” instead of teaching that “man is foolish,” which is more humbling and truer. But, because this lesson is humbling, it hurts, so people (and especially world-improvers) don’t want to hear it — they “can’t take the truth.” It’s much more fun to laugh or sneer at those OTHER jackasses. So much the worse for them. “Don’t tempt fate” and “all fame is fleeting” are the lessons a liberal education should somehow get across to students. If OTC it implicitly inculcates arrogance instead, it betrays its students and itself. It might be useful to note that the last time that atmospheric CO2 levels were as low as they are today, was about 267 million years ago; go figure. But I loved Econ (got an “easy A” in Econ 1 and loved it while everyone else was moaning… took that as a sign 😉 so I also have “linear programming optimization” and “International Trade & Finance” classes and such. Though, yeah, I’m much more impressed by the guy who makes hard things work than I am by the theorist with 4 degrees who says he couldn’t. FWIW the “Consensus” in investment theory is “The Efficient Market Hypothesis” that says you can not beat the market. Despite the long list of folks like Warren Buffet – as a recent example – who regularly do. See Goldman Sachs trading desk for an example of a group of folks consistently beating the market. So which was the correct market price for Goldman? The $200 prior to the crash, the $56 I bought it at during the crash? Or the $120 – $140 I sold it at? Or the price today? The efficient market hypothesis says “All of them!” Or how about Lehman or Bear Stearns – both market darlings up to just a few weeks before they became zero…. So I love Econ, and it has much to offer (for example, understanding fractional reserve banking and foreign trade balances); but breaks it’s teeth on the issue of econometric modeling and trading. The story goes that Woz (of Apple) was getting his college degree (at last, having made millions without one) under a pseudonym for privacy; and was assigned to do a floppy drive design. He, of course, turned in a circuit remarkably like the one he used in the Apple and Apple II (that had some ‘different’ behaviours, but also used about 1/2 the parts). Supposedly, he was admonished by the instructor that he had left out some critical parts (a pull down or buffering resister of some sort, IIRC the story) and had great difficulty not telling the guy it worked fine and had shipped a few million units! (and blowing his ‘cover’) Theory, meet realty 😉 Woz had originally made the design, so the story goes, by starting with a standard complex one then clipping out parts to see what was really needed and what was ‘fluff’, then tuning it. Always bet on the engineer over the theoretician. What a waste of time. They are basically saying that you look at a (relatively limited) range of data and how it varies, and attempt to predict what is going to happen based on that. There is no underlying model, no attempt to understand why things change, and no way that longer term effects can be incorporated at all, since they don’t look at a long time series. Another example of why climate “science” isn’t. It’s certainly not the sort of science I grew up with. Haven’t checked the journal, but the version referred to by David Stockwell (14:11:00) above is submitted, not accepted yet by the journal – i.e. the peer review process may not be complete. Personally, I prefer the (Johnny) Cochran test: It the model won’t fit, you must submit! No point spread, as the Warmists are all-in hoping for a hot summer card to bail them out. FOI is about to call. One thing that the researchers are ignoring is that in the field of personality testing, structural breaks in the results are seen to indicate when a person is lying, since a personality would not change over the course of a test, if the answers given suddenly start changing it means the subject is lying. It’s also useful for testing to see if someone is cheating, either on a test, or… on the data they are submitting for a scientific paper. A model will need very good start-point data. The only point that will do …… is the Big Bang. geo, I think it just goes with the territory. Like when they say a tropical storm – not a hurricane mind you – SLAMS into the coast. They have all those words written on the back of their pocket protectors. Never worry about theory as long as the machine does what it’s supposed to. Look where mathematics got us in the financial world! Hmmm, however, we are told that before the industrial revolution they were lower than now. Til 2050? Unless, of course there is another break. The two more recent breaks happened very close together comparatively speaking. There are people who at least seem to be able to guess market direction consistently enough to make more money on trades than they lose. But take any of the known indicators and put them into a program like NeuroShell Trader Professional, and you soon see that things like trend following indicators or a tool like the MACD are useless. Note that I’m not saying that they cannot be useful in the hands of a good trader. It’s just that trying to actually quantify these indicators is an exercise in frustration. No, the thing that is so hard for most to understand, especially the modelers, it seems, is that climate models are optimized on the historical climate data. And, there is no additional data to validate the models. We must wait for a considerable amount of time to even have an idea if the models are useful or not. Those who model markets know that it is folly to even try to use a model that has not been validated on strictly out-of-sample data. Even when validated on what should be out-of-sample data, one proceeds very cautiously when betting money on the output of the models. Now, I have had some experience in discussing modeling with scientists. I have had them insist that the modelers do not use the historical climate data at all when building the models. One in particular, in comments to an Ars Technica article, insisted that the models were based only on physics. This, of course, seemed far fetched to me, so I persisted in my questions. It finally was clear that the models used the historical climate data for validation. But that’s not quite right either. They were optimized on the data. But it still was impossible for posters there to realize the significance of this fact. To me, it was as if huge red flags were waving right in front of me. But then, I guess you need to build hundreds of models – and watch them run in real time over many years (in the markets) to understand why I saw the red flags waving. It helps to have the experience of betting your own money on the results of the models you have built. Your trading account statement regularly forces you to asses the usefulness of your models. I guess without that, I would be like the climate modelers and say that, yes, the models weren’t quite right, but they are new and improved now and I’m really sure now that they are right. Not only do they not have good data for either the independent variables or the dependent variable, they don’t even know what the independent variables should be in the models. Having done a fair bit of this kind of statistical analysis myself, I’m inclined to quibble a bit with the headline. Looking at the chart, and the error bars, they are not predicting flat temps through 2050 so much as they are predicting “pretty much anything goes” through 2050. Certainly, flat describes the middle of the prediction range, but the range is so broad as to be pretty cover anything. Now I think this is important to understand, because what it reflects is just how broad is the range of natural climate variability. I certainly think flat temps over the next two or three decades are a very strong possibility. But there will be lots of ups and downs along the way. The Met Office, on the other hand, predict that 2010 will probably be the hottest year on record. From their usual Roulette and ball style reasoning, which pervades their entire website, they say that it not a certainty. In fact they make one heck of a lot of uncertainty in their web pages. In reading through their pages, nothing has any certainty – models, climate, weather.. Despite the uncertainty they predict the average global temperature in 2010 to be 14.58F, which looks like a very precise certainty. True (and you resurrected a delightful memory for me). This looks like a simple extrapolation, which I guess statistically it would be. They are expecting that the period 1910 to 1970 is representative of the future. This is not a very good approach to model any form of reality. It’s like measuring the first 600 metres of a hill covered in fog and then predicting that it’s a mountain 1.2km in height. Now that I think about it, this situation is very much like H2G2 (come on fans). If you remember, Old Thrashbarg told everyone that he always knew whatever it was that was going to happen (had just happened) because he knew the ineffable mind of Bob. When asked what ineffable meant, he told the Lamuellans to “Look it up.” Considering he had the ONLY dictionary on Lamuella, it was a safe thing for him to tell them. It seems to me a trader’s market in weather/ climate forecasting is caaled for. Iowa Markets, isn’y it? Met Office Secret Hi-Tech Prediction Method Discovered? Weather forecasts are done by the most under rated sensatific system available to man in the 21st Century. wow… an entire half of their prediction is a fifty fifty chance, thats their best odds yet. Shame about the other half, one day they might work out that a one sided bet on the unknown is less probable than a no change scenario. Oh well, they’ll get there one day (if this trend continues). A econ stat model to predict the climate 100 years from now? What a load of pure rubbish. Desperate Statistical Wanking, pure and simple. I think some people are missing the point; the predictive model is on the assumption of no more breaks with the [cooling] ‘trend’ produced by the 97 break dominating the assumed AGW warming until 2050; that is internally consistent with the model but the point is that natural factors dominate AGW, which is discussed on page 9 of the paper. In respect of the markets; my wife is an econometrics whizz and we have little wagers; I have never lost; my ‘model’ is to look at the company essentials and then the company’s degree of affiliation with [a] government and the time to the next election; cause and effect really. As an engineer, I found that, unlike scientists, I had to deal with the real world. Nature can be very cruel and humiliating. I had to deal with inconvenient things, such as friction, tolerances and technological capabilities. Now scientists are able to take temperature measurements from around the world for over a hundred years and calculate that the earth had warmed by one degree. This is a precise number, with no tolerances or possible margin of error. If you do not believe this, you are, in the words of a Nature Magazine editorial, a member of the “climate-change-denialist fringe.” Any engineer would have to be brain-dead not to be skeptical of the exactitude of the scientist’s claims. But wait, there’s more. Other scientists have created global climate models which are couple with ocean circulation and, using these exact temperatures mentioned above, calibrated them to the same degree of precision. (Never mind the fact that much less complex models can’t forecast next week’s weather.) Here there is a problem. Using their all-encompassing ability to precisely model all of the natural causes of climate change, these scientists have determined that they can’t explain the observed warming. But, if they create a factor for Anthropogenic Global Warming (AGW) and run their climate models with this factor, they can then match the observed warming perfectly. Using this manufactured evidence, the IPCC can now say, with 90% certainty, that humans are causing global warming. I’m speechless. Sure is a weird one, that AP. In fact, the Sun is rather strange these days. On another note, the Sea Ice around Greenland is about to touch Iceland. It’s been wanting to do that for a couple of weeks now. I predict the temperature will rise 20 degrees by 2010 … plus or minus 100 degrees. There, now on to the stock market. Very true Richard, but since it is a well known fact that global mean temperature varies as the log of the CO2 atmospheric abundance (Steven Schneider of Stanford University says so), then the change since the industrial revolution in CO2 is nowhere near enough to make a hill of beans worth of difference; and we know that life on earth survived that 7000 ppm we used to have; or 20 times what we have today. And the change from pre-industrial to now, is quite consistent; even robustly so with natural variability. So nothing to see here; move along now. Let me get this straight, first they said that the equator would warm up BEFORE the polar region. OH, sorry, we got that wrong, BUT CO2 is the cause and we see the polar region heating up more than the equator. Not to worry, the basic model is correct…. Minor corrections guys, not a whole lot of changes until 2050 guys… AND this time OUR MODEL IS BANG ON CORRECT, trust us 100%!!!!! If these guys making the model become financial advisers and tell you where the market is going, I would STRONGLY advise you find someone else….. This is just a typical piece of research. It has no falsifiable prediction within the working life of anyone, but is intellectually entertaining. With a slightly different set of initial assumptions, it would show a secular decline after the equilibrium period. If this actually represents the “best effort” of the AGW community to rationalize a substantial NH cold spell, that position is tenuous. For a buck, I will forecast anything you want for the year 2065. Not only that I will guarantee that the forecast will come true in 2065 with my entire savings, my house, and my very life. Please do not look up the year of my birth before sending me the buck. So this is a paper based on the presumption of linear trends in climate? How do people get paid for writing such rubbish? Ahhh, the Chow test. That’s when you make a dog’s breakfast of unsavory data spiced with statistical tricks….. Served hot to the gullible. Models are simply explorations of the consequences of assumptions. Here the idea was to represent the more non-linear aspects of climate behaviour, sudden breaks. The assumptions, such as the existence of breaks, the alternating and considerable time between them, and an underlying warming rate of 0.5C/century are supported by a host of other physically based studies. This is a linear projection, elaborated by some breaks, justified both statistically and by physical studies. Most of the assumptions a fairly plausible, with the most uncertain being that another break up is not expected until around 2050. The current period is an analog of the period from the 1930s to the 70s. Will 2010 be warmer than 2009? Will 2019 be warmer than 2009? Will 2019 be 0.2 degrees warmer than 2009? The Atlantic Multi-decadal Oscillation (AMO) has a period of 60-80 years. So warm for 30-40 years and then cold for 30-40 years. So OK, maybe…. Within a section, the linear fit is good. The significance of the fact that the temperature anomaly data can be segmented is stated in the paper. Stockwell and Cox are not trying to explain why the data is segmented but rather demonstrating that the temperature anomaly data is segmented and therefore that CO2 is not a significant factor. Have to give E.M.Smith credit for taking a fresh look at climate analysis. Looks like I’ll have to reconfigure my Tradestation program for climate change analysis. That’s exactly what makes them appear as bold-faced liars. Thanks Mike. If a physical intuition helps, the model is composed of an underlying warming trend of 0.5C/century (that one could attribute to CO2), and two phases, a ‘cool’ phase which more efficiently dissipates heat than a ‘warm’ phase. The ‘cool’ phase just manages to keep the surface temperature constant, but the ‘warm’ phase is less efficient. Why this happens (why PDO and AMO) is speculative, and so not in the paper, but I suspect there is a natural resonance with a period determined by the path length of the ocean currents, and non-linear ‘energy capture’ can explain why the amplitude of natural variation exceeds that of the measured external forcings. Wacky? Not really. All well known physical principles. I try not to predict the future until it has happened. That way I am never wrong, unless I get my story from tv, the radio or the press. Guess what… Dr Pachauri has no climate science degree, but he does have a PhD in economics… just like Dr. McKitrick. See http://www.climatescience.gov/Library/bios/pachauri.htm (yes, a US government website) for Dr.Pachauri’s CV. First, thank you, Anthony for this great website. It has been for me as a layman a good jumping point for the literature regarding the great debate. As for this prediction and others like it they are not very useful bordering on the laughable. I do have one question for you, I have looked far and wide, what is the evidence of a corelation between climate warming and CO2 levels? We are just a part of the holocene. If they cannot model it, waste bin it. There is a limit to civility. Nobody needs to read warming alarmism in widespread bitter cold winter. People are succumbing out there. Nix the warming causes cooling stuff, ere tempers snap like power lines with too much ice on them. At least I now know I wasn’t seeing things yesterday when this post showed up briefly on the right-side listing, but when I went to the main page and reloaded it wasn’t there. So, and why is it that continuously rising CO2 levels will suddenly stop doing “their job” for the next 50 years? That alone amounts to admitting that there are other and stronger factors in play. They need to scrap the whole “CO2 is driving the climate cycles” as a base line. The real climate drivers are the cosmic forces, due to the movement of the solar system, on the trek around the Galaxy. It would be in error to not consider the 27.32 day cycles of the Lunar declination and the inner planet interactions that generate the yearly patterns, with consideration for the interactions with the outer planets that drive the 12 to 13 month cyclic return episodes, of severe hurricane and tornado surges in global weather patterns, that make up the natural variability. We will never be able to sort out their compounded signals, if we just look at the larger forces at work as background noise, which greatly overcomes any small CO2 signal that may be there. Only by looking at the periodicities, in the compound signal and finding the under lying long term compound pattern, where in they repeat on a similar time scale, so they can be looked at, as a complex background pattern of influences, in order to get any kind of model, or forecast that overcomes this background noise. I have found a background pattern of 6558 days that is one 27.32 day lunar declinational cycle short of a Saros cycle that does a fair job of reducing the ambient noise in the rest of the spectrum. Well enough that it repeats from the past three cycles to this one, good enough to generate a forecast that works for periods out to 15 years in length. I have posted the composite of the last three cycles, on a web site where they are made into maps, representative of the surface weather to be expected, this time around. The past three cycles were under the influence of high solar activity, where this one is coming in the depths of a longer than normal minimum. So it seems that the differences in the composites, to the actual (in missing some of the deep low temperatures) we are having might just suggest that the difference in solar activity is to blame. The data was pulled out of NOAA’s TD3200 CD data set in August, 2007 and tabled, then I started to process the data into grids and maps, which I posted on the site (starting in September 2007) for dates from 2008 through 2013. No updating of maps, or changing of dates except to adjust for one leap year shift in date, these maps are still the same as I generated them. In response to the quarry that, “no model has been able to predict the current surge in cold temperatures” I say this one has been better than most with a lead time of over two years to boot. You might want to take a look at how it has preformed over the past year, and how it is still doing now. As I said earlier the deeper cold temp extremes, that it gets close to but misses the core areas of the cold extremes, I think is a solar minimum feature. I think you will find that this new paradigm, answers a lot of questions about the driving forces of the global circulation, and bares further investigation, past the passive Beta strictly cut, copy, paste, make grid, and then map stage of development. First it was hockey stick, then worse than we thought, then climbing ever higher, and even higher and now it suddenly plateaus for 50 years… only to continue climbing conveniently later… give me a friggin break, the models are broken, they don’t work, the “science” is broken just admit it. Is it just me, or would anyb ody feel more comfortable with this “prediction of the next fifty years” … If they had only managed to use the ACTUAL temperature records for the past fifty years, instead of the (mal) adjusted and corrupted (er, adjusted) and massaged records from GISS and HADGRUD? 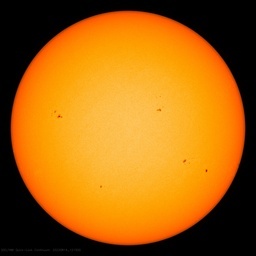 As far as I know, we have no accepted theory that can predict future solar activity. Lacking this may render any prediction of the Earth’s future climate problematical. This is exactly why, when I switched from science to music as a carreer, I went to a music college (conservatoire), not a university. My first piano teacher there was an international competition winner; the other 2 had been child prodigies (one in Britain, one in Greece). One of my pupils went to Oxford. His considerable practical skills counted zero to his degree (1st). I remember when the universities were complaining about maths students who had no ‘feeling’ for numbers. Perhaps this is why the AGWers can’t spot the silly answers. PS. The science I did learn was invaluable, technically, when I had to start teaching myself – the thinking process. Interesting post on trading. However, what trading tools do is capture the psychology of the market and display it in graphic form, as in MACD and other oscillators, and moving averages. Thus, certain patterns play out over and over because they capture certain moments of market mood. Eg, the blow off top becomes a top because it represents, firstly extreme exuberance (the blow off), followed by the reality (there are no more buyers left), followed by profit taking (as early long positions are closed), followed by dismay (as new longs see the price fall), followed by triggering of new stop losses. It’s all very interesting, but climate is not the collective sum of human psychology. I believe the researchers have hit on something interesting, based on chaos theory. It is known that chaotic systems have embedded repeating patterns (great attractors). If the climate is driven towards great attractors then there should be a fingerprint of patterns within it. This approach, I think, goes some way to trying to tease out this pattern using statistical tools, without attempting to define a physical mechanism. The main weakness is that it relies on unreliable data, which in itself, may invalidate the whole exercise. PS, got any tips for the stock market? 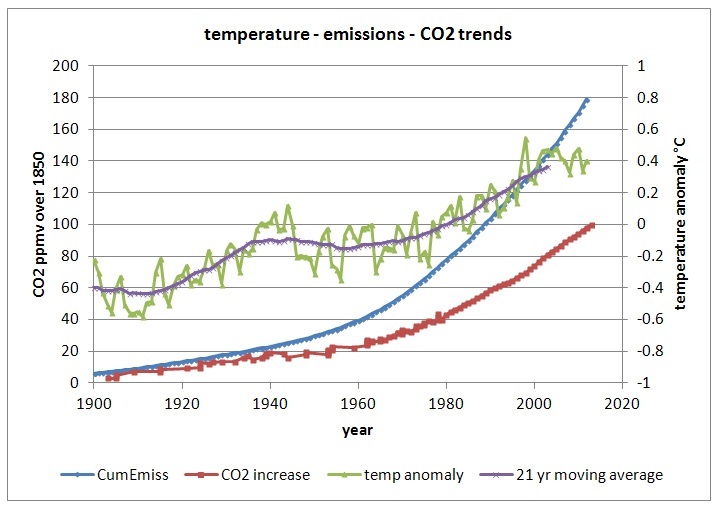 The Phil Jones econometric technique uses a data deficit to produce climate inflation. But if the test is run on doctered data, then of course the results mean nothing. I’d like to know which data for Australia were used, as we know that the CRU data for Darwin are under suspicion. That is the interpretation of some of the indicators. The reality is that the indicators only look at the actual data available. Opening price, daily high, daily low, and closing price. Volume. The other indicators are substantially just various ways of combining these in ever more interesting ways. (ignoring things like sentiment surveys, that are not really in the same class). So some indicators are called sentiment indicators (such as RSI) , and some are called other things, but they are actually just price / volume manipulations, by and large. So be careful with what you attribute to emotion and what the indicator actually does. as in MACD and other oscillators, and moving averages. And here you lump three completely different types of indicator together into one group. Bad Idea. Moving Averages smooth the trend and lag the response. All they show is price change as a function of time, smoothed. It says nothing more. Does a price rise because of good earnings? Or good news (sentiment)? Or because it was added to an index? Or from insiders buying (often in mechanically determined quantities) from fixed investment programs like 401k plans? Yes to all… So the SMA just lets you see that effect (and the accumulations of those effects). Nothing more. MACD is just a way to get the derivative (and a somewhat sloppy one at that) on two different time scales; then try to find the “jerk” (change of acceleration over time). It is just an attempt to remove some of the time lag that the moving average puts in. So all the things that move SMA move MACD, just sooner and faster (and hopefully still smoothed). Thus, certain patterns play out over and over because they capture certain moments of market mood. Eg, the blow off top becomes a top because it represents, firstly extreme exuberance (the blow off), followed by the reality (there are no more buyers left), followed by profit taking (as early long positions are closed), followed by dismay (as new longs see the price fall), followed by triggering of new stop losses. So is it REALLY that psych game you described? Or just that one reservoir of energy (stock volume) gets drained (market makers slowly selling out at ever higher prices) while another gets filled (long term investor tanking up) until a hysteresis point is reached, and at that point the energy (price) needed to get that last bit out and ‘flip the switch’ shows as a faster final rate of change? Don’t be so quick to toss out a tool that works just because your interpretation of why it works does not map; the underlaying processes may still, in fact, be analogs. SIDEBAR; earlier someone had said program trading with MACD always fell apart. Yup. Because MACD indicates best in markets with a relatively strong trend. When there is very little trend, it waffles badly and you get sporadic and sometimes wrong signals. In trendless markets, Slow Stochastic works better (it gives a ‘faster twitch’ that captures short “blips” better, but will trade you out of a good position in a strongly trending market). A third indicator, DMI, tells you how much trend you have. So when DMI is over 25, use MACD. Under 20, use Slow Stochastic. Between 20 and 25 they both work, but look at direction of change of DMI and trade toward the future. I.e. if at 22, headed up, swap to MACD; but at 22 headed down, use Slow Stochastic. Basically, the “isolate to test just one indicator” academic analysis will structurally fail to find what indicators work, because no indicator works for all market conditions. But a collection of indicators can. It’s all very interesting, but climate is not the collective sum of human psychology. Nor is the stock market, despite what the “learn to trade quick” books say. As noted above, there is a significant mechanical component. This approach, I think, goes some way to trying to tease out this pattern using statistical tools, without attempting to define a physical mechanism. As do indicators. It is only the user that brings a “physical mechanism” interpretation, not the tool. Interesting enough, most indicators are modestly robust to bad data. It’s fairly common in stock trading. Yes: Never trade on tips in the stock market. If you are not willing to learn what to do, and why to do it, you will just get killed. You are trying to get someone else to keep your spouse happy for you. It does not turn out well because your spouse wants YOUR attention, or will turn on you: one way or the other. If you just want something to buy and forget about for a long time, you want active management. A good mutual fund (or a company like Warren Buffets investment vehicle Birkshire Hathaway BRKA / BRKB ) A simple S&P 500 index fund beats about 65% to 75% of all money managers and strategies, so it is your benchmark. When in doubt, use it (ticker SPY or just about every company on the planet has a fund) and only move to something else when very well justified. But even there, the 10 year ‘business cycle’ really means you ought to be ‘in 8 years, out 2’ (“Out 2” ended a bit ago at the market crash bottom). What most folks do, though, is exactly wrong. Like right now just about everyone has stuck their money in bonds or annuities. Just in time for the Fed rate to be near zero. It can’t exactly go down much from here, so we know it will be going up next. And that kills bond prices. So all the folks who rand to bonds and muni’s are going to get whacked again as the FED raises interest rates… (Now is the time to be selling bonds, not buying them. Oh well…) Bonds ARE NOT SAFE and can drop a lot in value as inflation kicks in and the Fed raises rates. Bond FUNDS are worse as a fund never matures so you can’t just wait for a return of principle at maturity. If you want to know more, hit my site. In my experience, most folks claim they want to know how to invest, but in reality just want lazy gain. Well you can’t get excess gain while being lazy… But since most folks don’t want to learn the complicated bits, it would be inappropriate to put more here and bore everyone else. When your colleague tells you at the coffee machine that oil is getting scarse and can only go up in price from now on: Sell. Some notes of mine. Ferdinand is an expert on CO2 measurement AFAIK. There is an extreme good correlation between accumulated emissions and the increase in the atmosphere over the past 46 years. 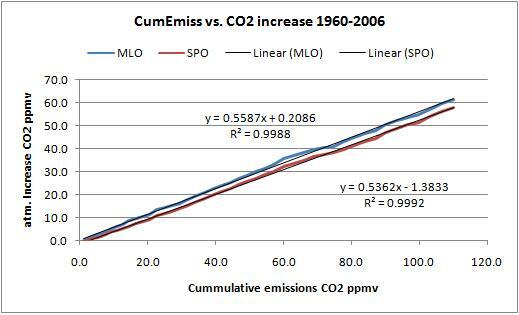 increase in lag of the SH CO2 trend. even if the temperature doesn’t increase in the 1945-1975 period and in the current period since 1998. How can you call an unexplained trend change analysis as a model and how many unexplained trend changes are we going to have in the next 40 years? And if these unexplained trend changes werent predictable before, how can you be sure that it will then warm up again as predicted by the old disgraced models. This looks like a way to save AGW face until we are all dead. I would hope people would not just roll their eyes when reading your post and go on to the next one. I had the good fortune to listen to presentations by Theodor Landscheidt in the early 90s. I also was able to visit with him after the presentations. I suspect that there are a fair number of scientists who were relieved by his death, as he predicted the last three El Ninos prior to his death with no predictions that did not occur. As to how this pertains to the subject of this thread, I suspect that when more research is done, it probably will be realized that the forces he studied are responsible for most of the climate variations. One more prediction I distinctly remember. In the early 90s he said that equity yields would be low worldwide due to high inflation around 2011. After visiting with him, I was encouraged to write an article on cycles in tree ring data in the Midwestern US. It was published in CYCLES magazine. He responded to me that he thought the article was interesting. If the major cycle I found is valid, the corn belt should see serious drought in the years surrounding 2014-2015. I assume then that the global warming alarmists will be very vocal about how we have resumed the upward temperature trend. I might disagree with you on using the DMI in conjunction with the MACD. Again, trying to quantify these in NeuroShell Trader is extremely easy – and very frustrating. But market analysis is very similar to climate analysis in this way, isn’t it? The key is to predict when a market (climate) is going to trend or not. (Of course, first we need to define what a trend is, don’t we.) But if we can predict a binary filter – zero or one – trend or no-trend, the rest is trivial (as to the tools we use). I enjoyed your observations. Thanks. Saddly all based on the HadCRU results now known to be fudged. Yes and the plants DO NOT like low, they much prefer 1000ppm. The idea that the Vostok Ice cores show the correct geological range of CO2 from below 200ppm to 300ppm is laughable. As someone here once pointed out if the CO2 levels were below 200ppm during the last Ice Age all there would be is grass because everything else would have died out. I have seen information stating growth stops at 180ppm and all plants are dead by 150ppm with grasses being the most hardy and trees the least. Stomatal response to CO2 comes up with much higher numbers than the Ice Cores. The same place it gets us with Cap & Trade…. Richer bankers and poorer peons. Who do you think was behind the Enviromental/AGW scam in the first place? The banker/oilmen of course. Tie up the resources (scarcity), regulate the competition (pack the agencies with YOUR puppets) and now the crowning piece – Cap & Trade. Actually it has been an absolutely brilliant piece of public manipulation and has netted certain folks millions if not billions. They must be really ticked about Climategate and all the snowstorms. Anyone know what the units of Temperature are? This chart seems to indicate that they are in Temperature anomaly units. Plot you data against absolute units folks. The only reason this chart looks even remotely interesting is that we have zoomed in on it so heavily. Starting from a consistent zero point and maintaining ranges is something we need to do to make the science in this are better. I just read a newer post about analysis of temperature data comparing Urban and Rural temperatures and the ranges were different. Glancing at the graph you get a the impression they are close to the same, but because the ranges were different they really said 2 different things. Charting is a wonderful tool for finding data. It is also a wonderful tool for fooling yourself. The greatest sin the climatologists have committed is fooling themselves with their charts of data on nonsensical axes. Every engineer here knows what happens to calculations if you use non-absolute temperatures — you get nonsensical answers (unless of course you are dealing with delta t problems. Boy that is the best one sentence summations of “Climate Science” I have seen yet. A very pretty way of saying garbage in garbage out. Thanks, E.M.Smith, for the considered reply to my posting. You have made me reconsider my original thoughts on indicators, which is a good thing. In hindsight, it was over simplistic to describe the market as just the sum of human emotions, even though emotions are a part. It is a very complex thing and I don’t expect to reach your level of understanding. I do trade on the NYSE but I seem to spend most of the day on WUWT, so I guess this is where my interest lies. I will take a look at your site however, and see if I can learn anything. Instead of “forces” & “responsible”, I would say “variables” & “related” – there’s so much confounding …and it’s not necessarily physicists who have the skills & background to initially pull the patterns together. It’s good to see so many people cluing in. What is needed soon is a book that illustrates (for a lay audience) the utility of recurrence & wavelet methods in deciphering the deterministic aspects of chaos. There need to be chapters on conditioning and deeper chapters on complex conditioning, illustrating many examples of how pure determinism generates low linear [amplitude] correlation. It needs to be emphasized that complex conditioning often looks like chaos. Phase-aware analysis methods need to go mainstream – and soon. Perhaps paradox can be rendered approachable by talented, patient communicators. Is it just me, or does the graph in this post indeed show that the temperatures from the last 10 years fall in general above the extrapolated trendline from the 20 years before? So there’s nothing strange about the last 10 years of temperature development? And that this doesn’t suggest at all that we should expect a pause in the warming (let alone a decline)? I hope we’ll soon get to the part where everybody’s finally convinced he’s a fraud, and he is asked “did you foresee this?” as he is attacked. The test is not unknown in statistics. Basically, a significance test between the slopes of two regression lines to determine whether the underlying process has shifted. (It’s easy if one of the lines is slope=0. All sorts of processes experience phase shifts.